What is a full thickness corneal transplant? A full thickness corneal transplant is done to remove a diseased, infected, or scarred cornea. It's replaced with a healthy cornea from a person who has died. 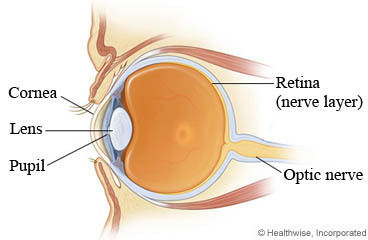 The cornea is the clear surface that covers the front of the eye. In most cases, you will be awake during the surgery. The doctor will put medicine in your eye to numb it. You may also get medicine to help you relax. Or you may get it to make you sleep during the surgery. Surgical tools are used to keep your eye open. You may feel some pressure in your eye. The doctor makes a small cut (incision) in your cornea. Then your cornea is removed. The doctor puts the new cornea over your eye and sews it into place. You will usually need to visit your doctor to have the stitches removed. The stitches may be removed all at once, or they may be slowly removed over months or years. This transplant takes about 1 hour. Most people go home on the day of the surgery. After surgery, you will need to wear an eye patch for about a day. Then you will need to wear a clear eye shield or glasses to protect your eye. You'll use this until the eye has healed. You will probably be able to go back to work or your normal routine in about 1 to 2 weeks. But your vision will still be blurry. You will need to avoid heavy lifting for about 3 to 4 weeks, or until your doctor says it is okay. Enter C523 in the search box to learn more about "Corneal Transplant (Full Thickness): Before Your Surgery".